It's been a while since I looked at the latest computers on the market, but computers with 1 terabytes hard drives! When did this happen. And, who needs that much memory to begin with? To my knowledge, a "terabyte" is a trillion bites. Apparently a trillion is the new gigillion. I'm aware that computer manufacturers must simply be keeping up with their competitors, but it still strikes me as overkill. Meanwhile, my five year old computer came with a 500-gigabyte hard drive which still has 91 percent of it's memory cells empty. Which brooches the question, how many gigs are on today's SD card? Another thing, "all-in-one" computers like the one in the photo above? I saw some of the earlier forerunners on the display shelf a few years ago, but I never thought that all-in-one's would gain in popularity. 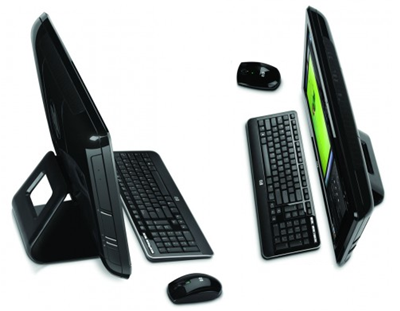 Except for the separate keyboards, essentially, all-in-one's are bulkier laptops. I guess it's easier to move with you from the living room to the backyard pool. You won't have to ask the butler anymore because of the portability. In tv news, since that's about all I watch on tv asides from tonight's Hawaii Five-O, the reason Mr. Mubarak doesn't bag out of Egypt is for a less mundane reason, that is, he doesn't know where to go. For example, is the US going to welcome him here? I don't think so. But between you and me, how about Hawaii? The soon to be deposed pharaoh is worth between $25-75 billion, thus Mubarak agrees to pay for Honolulu's $5.4 billion light rail, and the rest as they say is history. On the very top of Mubarak agenda, is positioning a successor, one that agrees to suppress any movement by Egyptians in the future to try him for past deeds during his political afterlife. Sorta like Nixon hand picking Gerald Ford as his replacement. Ford later pardoned Nixon. I'm afraid I need that terabyte. I've got a terabyte external drive right now for all the photos I take on travel, etc. Kay- well I guess terabytes are the standard now. The more I think about the Mubarak humor, the more real it sounds. Calif. would invite him without giving it a second thought with their state's deficit. Amazin what a few billions to spare affords you. Kirk- I blink for a second and the next thing you know, I way behind technology. What can I say. People who download a lot of media, like movies and music videos, tons of music and have lots and lots of pictures need huge hard drives. Some people like to take pictures at the biggest settings, etc, and one movie can be upwards of 1.5 gigabytes, depending on the file quality. The biggest SD card I've seen was 64 GB. I think All-in-Ones appeal to people who have limited desk space, or who don't want a large tower under their desk. In small apartments like what you find in NYC, that can be a benefit. Mubarak will probably move to Singapore. Brad- home videos would take up a lot of HD space. I guess not doing that, I never thought of it. I'm thinking Mubarak moves to Switzerland.